Hill Meadow Farms will be sold regardless of price at a no reserve absolute auction on June 30th, 2016. When you combine the refinement of luxury living, with the serenity of 76 acres, add relative proximity to skiing, golfing, historical sites and major metropolitan areas like Washington, DC and Baltimore; the result is Hill Meadow Farms. A unique, must-see retreat being offered at a rare luxury absolute no reserve auction with Supreme Auctions, in cooperation with Mary Llewellyn of Keller Williams Realty, on June 30th, 2016. Hill Meadow Farms offers the unique distinction of including luxury living with rolling hills in one stunning property. The property is a landowners dream; with fenced-in pastures, gardens, hunting woods, several barns, a three-bay machine garage and log cabin built in the 1800s. The home itself sits on the rise of a hill, like a sentry watching over the land. Hand-made Cushwa Birch brick and chisel-cut limestone give the home a distinguished Colonial look, while the red cedar Palazzo-style front door, Faux Venetian plaster wall treatments, and curved staircase in the foyer are elegance itself. Family areas include informal dining and gathering areas, 2nd floor bedrooms, and a sitting area provide the perfect balance for entertaining, including a Tuscan wine cellar and tasting room, formal library, plus first floor guest suite. The spacious master suite offers every luxury, from the Thermasol two-person steam shower and Kohler Vintage porcelain soaking tub, to a walk-in closet and brick fireplace and hearth. 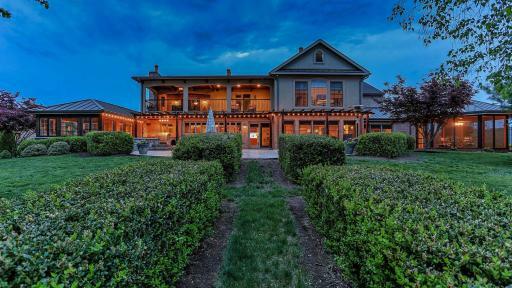 2,000 square feet of porches, decks, and patios offer plenty of space to enjoy mountain and farm views; one of the current’ owner’s favorite is privately and conveniently located right outside the master suite. While serenity and seclusion are in plentiful supply, the property is a short distance from Downtown Hagerstown, Whitetail Ski and Golf Resorts, and the C&O Canal biking trail. There are over 20 colleges within a one-hour drive, and historical sites like Gettysburg, Shepherdstown, Charles Town, and Ft. Frederick are close as well. Hagerstown Regional, Ronald Reagan Washington National, and Baltimore-Washington International Airports provide easy travel options in and out of the area. With Washington DC and Baltimore both 85 miles away, arts, sports, shopping and business opportunities are just a drive or train ride away. Interested parties can call Supreme Auctions directly at (866) 929-2243 or visit www.supreme-auctions.com.